Is that tuna? Or meat from an endangered whale? Fraud runs rampant in the seafood industry, but blockchain (the technology supporting the growing cryptocurrency market) could help ensure the fish you order in a restaurant is the fish that finds its way onto your plate. In 2016, Oceana, an ocean conservation advocacy group, compiled a report drawing from 200 published studies on seafood fraud. Based on their findings, a whopping 20 percent of seafood is not labeled correctly. The problem extends to all corners of the globe and at all levels of the supply chain, from the people catching the fish to those distributing and selling it. The seafood mislabeling infractions detailed in the report ranged from the relatively minor (a restaurant advertising wild salmon but serving a cheaper farmed salmon) to the downright disturbing: sushi chefs purposely mislabeling endangered whale meat as fatty tuna in order to smuggle it into the U.S. The consequences of mislabeling pop up in global health, the economy, and conservation efforts. According to the Oceana report, the best way to combat them is by increasing traceability. 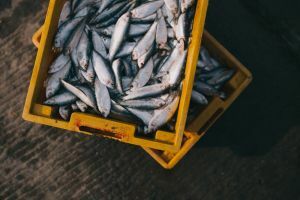 The report asserts that a more detailed and transparent record of information about the fish as it moves along the supply chain could help decrease instances of mislabeling. Blockchain could provide this record. Though most commonly associated with money, blockchain’s utility isn’t limited to the world of finance. At its core, the technology is simply a secure, transparent way to record transactions. A number of companies are looking for ways to apply it to the seafood supply chain. In April 2017, Intel released a demonstration case study showing how Hyperledger Sawtooth, a platform for creating and managing blockchains, could facilitate seafood supply chain traceability. That study used sensors to track and record information about a fish’s location, temperature, and other characteristics as it moved from boat to restaurant. In January 2018, the World Wildlife Foundation (WWF) announced their appropriately named Blockchain Supply Chain Traceability Project. Through that project, the WWF and their partners are cracking down on illegal tuna fishing by recording every step along the supply chain on a blockchain. Of course, getting everyone along the supply chain to agree to a new recording system might not be easy, and that’s why a blockchain-based seafood solution like Fishcoin could be useful. The idea behind that project is to reward people all along the supply chain for providing valuable data directly to those at the end of it. For example, fishers in developing nations might send a restaurant or grocery store information on the seafood they caught. This triggers a smart contract that transfers a certain number of Fishcoins into those fisher’s crypto wallets. The fishers can then exchange those Fishcoins for something of value to them, such as prepaid cell phone minutes. Most of these projects are still in the development stages, but should they take off, it could have far-reaching implications for global health, the economy, and, of course, your dinner plate.